Idaho is one of those states without a stand alone, centralize place to explore and plan for college, or at least not one I could find. The Idaho State Board of Education provides a list of public and private four-year institutions. The most useful aspect of the website is the listing of Idaho Scholarships. Users can download a copy of Higher Education in Idaho which is published by The Idaho Association of Collegiate Registrars and Admissions Officers. This provides a profile of colleges in the state, a list of programs available by institution, planning guide for juniors and seniors, and basic information on the Idaho Career Information System. The Idaho Career Information System doesn’t have an obvious link to the college planning process. The menu bar across the middle of page doesn’t give any suggestion that the system would be useful to high school students. However, if you go to the Guest Login, you’ll find all the expected information on the college application process including a college search function and financial aid information relevant to Idaho. If you create an account, which requires a social security number, you should be able to use the portfolio features. I didn’t so I can’t tell you how useful they are. 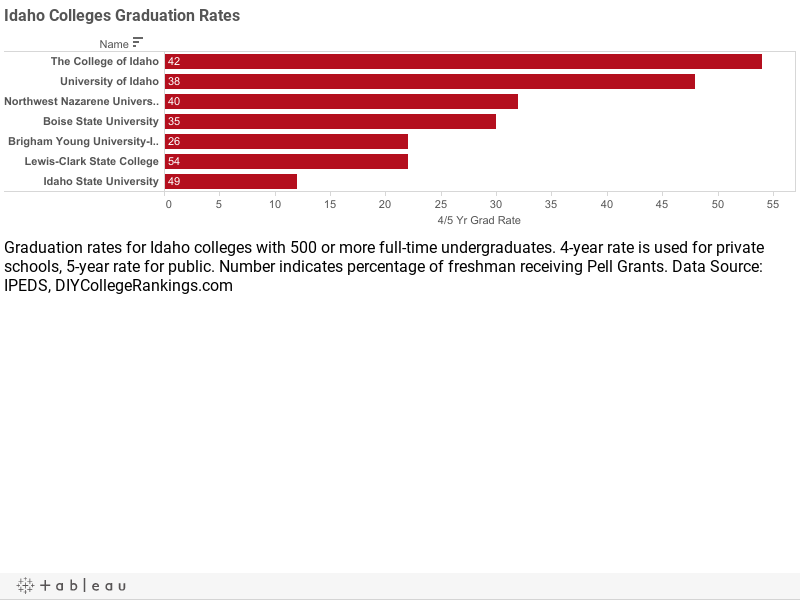 There are seven four-year Idaho colleges with 500 or more full-time undergraduates. There are three colleges and four public universities according to the Integrated Post-secondary Data System. Of the 46,489 students, 36% attend private Idaho colleges and 64% attend public universities. The average four-year graduation rate for private colleges was 36% and the average five-year rate for public schools was 28%. Only one Idaho college met the DIY College Rankings 50-50 profile requirements. The average SAT score for seniors in Idaho was 458 for Critical Reading and 456 for Math. The 75th percentile scores were 530 for Critical Reading and 570 for Math. A total of four Idaho colleges had 75th percentile scores equal to or higher than the state in both categories.